School Pathways SIS personalizes education to meet the needs of students, staff, and schools. Sign up for a School Pathways Academy! Affordable solutions for all school models. Student Information Systems are capable of amazing things. Most are designed to be one size fits all with little room for adapting to an individual school’s needs. School Pathways takes a radically different approach – one with you in mind. First we listen. Then we support. Because every school is different. An integrated student application and re-enrollment system that allows for digitally signed forms, orientation scheduling, and surveys. We offer CALPADS consulting with the aim of getting you certified quickly. Take the first step to a less stressful year! Let School Pathways SIS experts help take on some of the chores of running your school so you can focus on educating students. Your programmer knows his stuff, but he is personable, helpful and nice! All of you at School Pathways have been excellent and service-oriented. Keep up the great work with your excellent product and service! I love the way the reports at our school look professional and uniform. Thanks so much. You guys are great. The success of your business is reflected not only in the quality of your product but in the superior service you provide your clients. Thanks for making our job easier. Your student information system is so much more fluid than what we used before. I start at the beginning and go to the end, and I am done. There is no room for mistakes! Now that necessary documents have been delivered and I can breathe again, I want to thank you for your help. Those reports you and your team created allowed me to produce important information quickly. There is a lot of NCLB/HQT talk flying around, so this review of what is in the system was excellent. I welcome chances to correct/update/improve my information in the SiS. Every new situation helps me gain valuable knowledge and experience, and I really appreciate the priceless support from you and all the great staff at School Pathways. Thank you! You guys are always so patient and kind. I really appreciate it. First off, I can’t believe you responded and acted after work hours. Again, thank you. Thank you for your time, your insight, and your support! 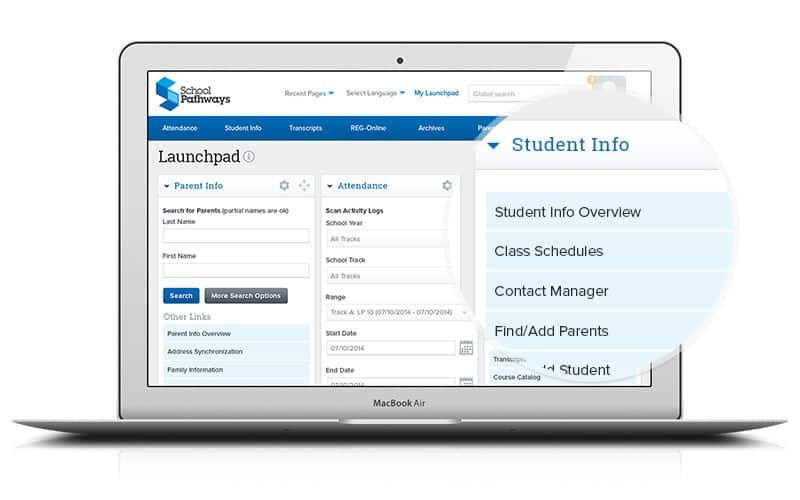 Working with School Pathways was an incredibly user-friendly experience. Uncommon to have such excellent customer support combined with a very affordable service cost. I have worked with another student information system for the past 14 years and loved it. But in the two days that I have been using your program I already like it so much more. It’s user friendly and the live tech support has been great … everyone is easy to work with. School Pathways is awesome! Their professional and expertise in CALPADS reporting is unsurpassed. They were there every step of the way with the help and encouragement that I needed. I would recommend the services to any district wholeheartedly and without reserve. I found the consultants at School Pathways were able to answer all my questions in a simple, straight-forward way so I could not only correct all of my fatal errors but understand the process as I went. I am looking forward to working with them again for this year's submissions. With the volume of our schools' students it would have been close to impossible to fulfill our reporting requirements without School Pathways' help. I am grateful to their team! School Pathways: Real people with real solutions. The reputation of the School Pathways team has grown to that of professionals who listen to the needs of clients with a response that is both quick and effective. We pride ourselves on our support.